Samsung on Sunday introduced two new models of its flagship Galaxy smartphone line at the annual gala for the mobile world, the Mobile World Conference in Barcelona, Spain. 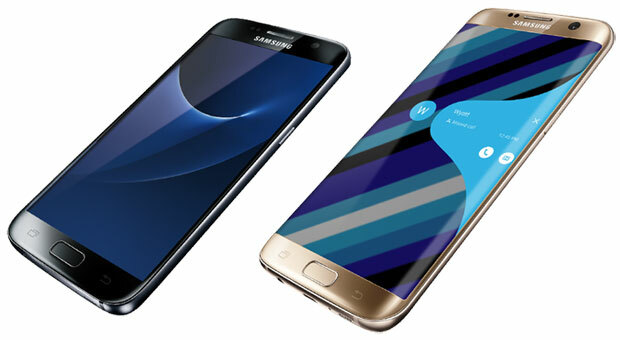 Both phones have similar features, but one, the Galaxy S7 Edge, has a 5.5-inch display, the same size as the iPhone 6s Plus. The units have curved screens that support quad HD resolution, as well as a slight curve on the back, making them easier to hold. To soothe complaints about the battery life of the previous Galaxy generation, the units have received power boosts. The S7 Edge has a 3,600-mAh battery, a jump from the S6 Edge’s 2,600, and the S7 has a 3,000-mAh power supply, while the S6’s battery was only 2,550. In addition, the units are water and dust resistant, support microSD storage, and run on Android 6.0 Marshmallow. Samsung also has made some changes in the Galaxy’s camera. It has reduced the number of megapixels on the shooter’s sensor to 12 from 16, but increased the size of the pixels, which should improve the camera’s performance in low light conditions. The pixels in the new Galaxy models are 30 percent larger than those in the iPhone 6s Plus, 1.4 micron compared to 1.22 micron for Apple. Both Apple and Google have gone the fewer-but-bigger-pixel route with some success, so Samsung’s rivals already have done some of the consumer education about the move. “It will work as long as they frame it in terms of bigger pixels get more light,” said Daniel Matte, an analyst with Canalys. Larger pixels also make it easier to incorporate into each pixel autofocusing technology, which allows the camera to take sharper pictures faster. “Autofocus is really fast now — nearly instantaneous anywhere across the image,” Matte told TechNewsWorld. “They’re a nice improvement over previous versions, but they’re not groundbreaking,” said Bob O’Donnell, founder and chief analyst at Technalysis Research. “There isn’t any one feature that’s a killer and will massively move the needle in the market,” Matte said. “The best addition they made was adding Qualcomm’s Snapdragon 820, which in certain use cases doubles the performance,” Patrick Moorhead, principal analyst at Moor Insights & Strategy, told TechNewsWorld. For consumers who preorder either of the new phone models up to March 18, Samsung is offering a sweet deal: a free Gear VR headset. In addition, Oculus is offering those who preorder the phones six Gear VR games for free. Will the lure of a free VR headset help boost initial sales? “There’s not that much content out there for VR, so it’s more of a gimmick at this point,” Technalysis’ O’Donnell told TechNewsWorld. “They’re going to incent people to try VR,” said Gartner Research Director Brian Blau. Samsung, as well other smartphone makers, would very much like to change the current picture for smartphone sales. “We’re seeing a lengthening of upgrade cycles for smartphones and growth is slowing. It’s going to be hard for anyone to do well in the smartphone market in the next few years in terms of growth,” Canalys’ Matte said. In the United States, another factor contributing to longer upgrade cycles is the phasing out of phone subsidies. “Now that people are paying full price for their phones, they want them to last longer,” O’Donnell said. “Lifetimes are extending beyond two years, so just as we saw lifetimes extend for PCs, we’re going to see them extended for phones,” he added. Nevertheless, Canalys is predicting another double-digit growth year for smartphones this year. Globally, it predicts smartphone shipments will crack 1.5 billion in 2016.